Hawkesbury and Sale are our two destinations this week and we take nice chances to each meeting - Nordic Duke and Suspicious Minds both looking well placed. Wide at his most recent Hawkesbury assignment, Nordic Duke (pictured) was far from disgraced and with a drop in class on Wednesday he should prove, says Michael Moroney "hard to beat." "He has had a bit of time in between runs but he has been going really well," he said - "and this does look the right race for him." A horse who appreciates the sting out of the ground, Nordic Duke will be ridden by Christian Reith in the BM790 Coonamble Reunion Handicap. Meanwhile Patrick Moloney takes the ride on Suspicious Minds who takes her place in the Eastcoast BM70 Handicap at Sale on Thursday. Also down in class - having contested a strong 1600m at Flemington when resuming - Suspicious Minds has been kept to that trip having "raced well above herself." 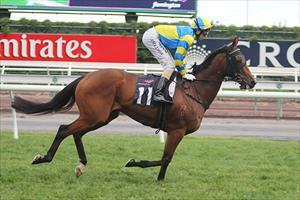 "But she has improved since and she boasts a good second up record," Moroney said.